Quality Leather Slapper with metal inside, very effective striking tool. Professional-grade and made from top-quality leather, this leather slapper is available in two sizes. One is 8 inches and the other is 11 inches. Because of its shape, it would be easy to slip into a pocket or handbag. These saps include poured lead inside for durability, strength and added weight. Beavertail-shaped slappers such as these have been used to intimidate people since the early 20th century, particularly in close-combat situations. 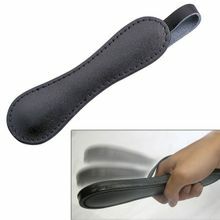 These leather slappers feature sturdy stitching and an ergonomic grip, and they are identical to authentic saps. In some locations, these bludgeoning impact weapons are authorized for use by law enforcement. They have built-in retention handles, so they will stand straight up in a display case or on a shelf if you choose to display them in a collection. 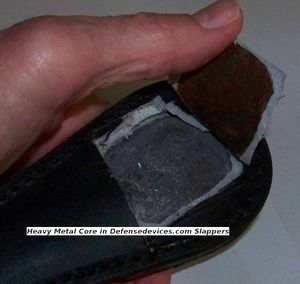 As you can see from the second picture the interior core of these bad boys is real metal. I cut the leather away to expose the heavy metal inside. A tiny bit shorter than I expected, but very solid, and well made. Excellent quality, for the price.